Like many other states, Arizona is active in pursuing changes in both legislation and with the Supreme Court to make it easier and safer for process servers to do their job. One of the most promising efforts is before the Supreme Court, which would give process servers a way to serve those currently shielded by private gated communities. 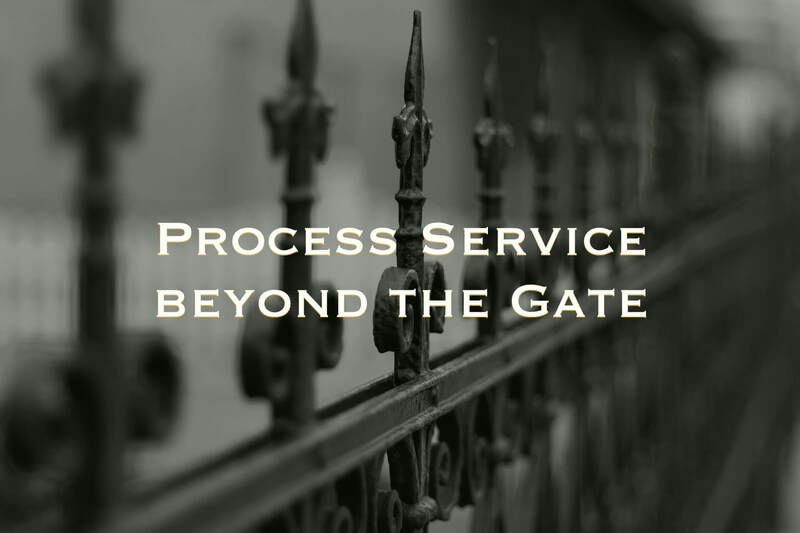 Gated communities often present a roadblock for process servers. Process servers who are given an address located within a gated community are typically faced with either the potential of violating trespass rules (rendering them unable to complete the service) or they are forced to deal with an evasive intended recipient who refuses to accept service. Because these gated communities are often guarded by a security officer who refuses access, these citizens are not able to be served. Justice, for those seeking it, is blocked by the gatekeeper, especially in situations where the service is time-sensitive. Citizens not residing in a gated community are not afforded this same ability to dodge service, and in effect, are given impunity. As the ARCP is currently worded, there is no special exemption for service of process, which in turn ignores the citizens right to due process and prevents those attempting service from doing their jobs. The proposed Rule change would essentially treat the security guard or gatekeeper as a representative of the homeowner, which would allow substitute service. This would create an opportunity for civil process servers, as well as constables or sheriffs and their deputies, to effectuate service on the gatekeeper who is restricting access to the individual to be served while still respecting the citizen’s right to privacy. The proposed ARCP Rule change cites neighboring states California and Nevada for having statutes that address this issue. The pending Rule change is in progress. There has been an ongoing effort to get a process server assault Bill passed in legislation; however, previous attempts have been thwarted by non-supporters in legislation. In 2012, SB1140, was presented and failed. In 2014, SB 1198 was presented and failed. The current 2017 assault Bill SB1075 is sponsored by Senator Kavanaugh but is currently stalled in the Senate. All of the aforementioned Bills were written so as to meet the needs of both process servers and legislators; however, it is often met with opposition in the Senate, with many senators asking for data on the prevalence of assault and others voicing hesitation to give process servers the same protections as peace officers. Unfortunately, the mindset that process servers are just regular people making deliveries prevents protective legislation from moving forward. As more bills have progressed and more becoming law, most recently, in New York, there is hope that process servers will be given the respect under the law that they deserve. Arizona process servers have exhibited relentless perseverance in pursuing this legislative change. Hopefully, they will succeed as other states make changes to further protect process servers under the law.